A striking example that the human is not the only living being to use decoys to seduce, the Hobblebush displays a ring of sterile flowers, much larger and that bloom earlier than the fertile flowers, who will flower in the center of these fake baits. The vegetal equivalent of a pair of socks in the pants of some singers or silicone breasts! 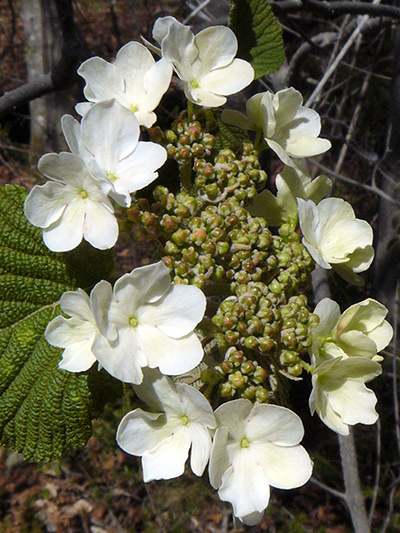 The Hobblebush is one of two plants called "moose woods" in Quebec (see the Uses section for more details). Its fruit goes from yellow to orange, to red and finally turns blue, these colors can be found at the same time on the same individual.